Althea and Oliver have been neighbors and friends for ages. Althea would like their friendship to bloom into something bigger, but Oliver is reluctant. He's got bigger issues -- suffering from a sleep disorder that causes him to experience black outs that span multiple weeks. He'd like to find a cure and just be a normal person. The combination is combustible and Althea makes an error in judgment that drives Oliver away. Coincidentally, a research study has been announced in New York that Oliver can participate in. That it gets him away from Althea is a not-so-insignificant side benefit. 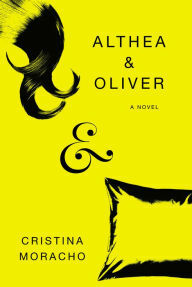 Distraught from their separation, Althea gets suspended from school and runs away from home, following Oliver to New York. Meanwhile, with lots of time in the hospital to think back on what has happened, Oliver begins to regret his decision to flee. All might have been well if they had managed to reconnect, but fate works against them and they are both plunged into the wilderness. Surprisingly, this turns out to be exactly what both of them need. It's a weird story that I found hard to track. More precisely, it is really two separate stories. Both of them are seeking to change their own lives, but there have very different paths to take. This is quite obvious from the beginning and, despite Moracho's attempt to depict them as close friends, I never noticed much chemistry between them. They were both interesting characters, but at their best when they were on their own. And while the novel was vibrant and original, Moracho's dialogue-heavy style didn't work for me. Instead, I found it a hard slog getting through lengthy conversations that I could not understand or see the relevance of to the story.